Seriously, I do love tomatoes, I always have and this year I've been able to grow a few of my own in a container on our patio. If you know me at all, you know what an amazing accomplishment this is. I usually kill any plant under my care in 2 weeks or less, but this year I managed to keep a tomato plant and a few herbs alive well into August. My mom (who is the queen of green thumbs) is so proud. I am also blessed to live in an agricultural area that has an amazing assortment of local farmstands, the tomatoes have been particularly fantastic this year and there's a stand right across the street from our home that I frequent (sometimes twice a week). This time of year tomatoes are in abundance around here, kind of the last "hoorah" of the summer and this recipe is a perfect way to celebrate. It takes a little bit of planning, making the crust the night before and getting the extra liquid out of the tomatoes, but it is completely worth it and so simple to assemble. You can also really customize this recipe with different types of cheese or leave out the meat completely if you like. The original recipe called for heirloom tomatoes, but any type will work. I honestly used a mix of cherry tomatoes (off my own plant) and some hearty beefsteak tomatoes from our local farmstand. I also consider it an amazing achievement whenever I unmold a pastry from a springform pan successfully, so if anyone was spying on me in my kitchen last night, you witnessed an embarrassingly enthusiastic happy dance. So be it. 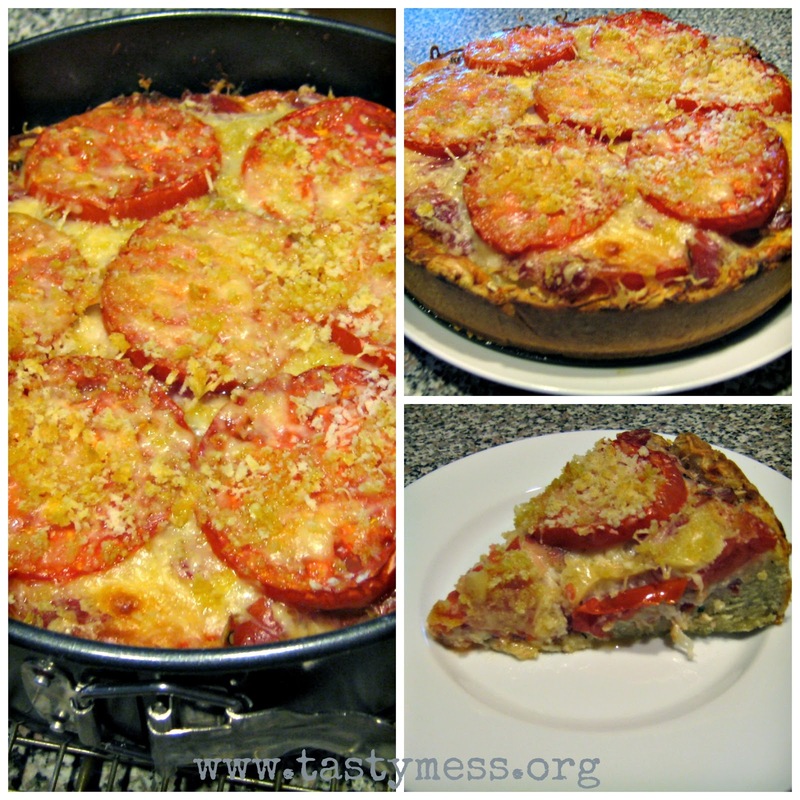 I hope you give this recipe a try, it's amazing and the crust alone is worth the planning ahead! 1. Make the crust the night before so it can firm up and chill overnight. If you don't have time to do this, make sure it chills in the fridge for at least 2 hours. Combine the flour, sugar, 1 tsp. salt and rosemary in the bowl of a food processor. Pulse a few times until combined. 2. Add in the butter and pulse until the mixture looks like coarse meal. Whisk together the eggs and egg yolk in a separate bowl and pour into the food processor with the motor running. Process until the dough just comes together. 3. Dust a clean surface with flour and gently knead the dough until it becomes smooth and pliable, only takes a few minutes. Press the dough into the bottom and about halfway up the sides of a springform pan. Cover and refrigerate (see step 1). 4. Slice the tomatoes about 1/4 - 1/2 inch thick and spread out in an even layer on cookie sheets or a cutting board. Sprinkle lightly with salt and let sit for 30-45 minutes, this will help draw out a lot of the excess moisture. Pat the tomatoes gently with paper towels to absorb the water. 5. Combine the Italian blend cheese with 1 cup of the grated Parmesan in a small bowl, set aside. 6. Preheat oven to 400 degrees and sprinkle 1 tbsp. of Panko into the bottom of the crust. Top with 1/3 of the tomatoes and scatter about 1/2 of the ham strips on top. Add in 1/2 of the cheese mixture and then start layering again (panko + tomatoes + ham + cheese mixture). Finish with the last third of the tomatoes and remaining 1/2 cup of parmesan. Drizzle with olive oil. 7. Place on a baking sheet and bake for 30-40 minutes. Transfer the pan to a cooling rack and let cool at least 45 minutes before unmolding and slicing.